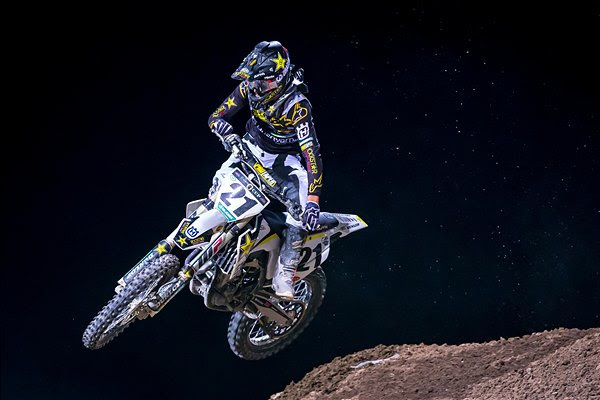 The Rockstar Energy Husqvarna Factory Racing Team had a podium night at the Monster Energy Cup, held at Sam Boyd Stadium in Las Vegas, Nev. on Saturday. Jason Anderson earned second overall after three challenging motos encompassing a difficult Joker Lane that had to be taken by each rider once during every moto. Anderson rode strong despite limited seat time and brought home a well-earned second-place finish. "The night went pretty well," said Anderson. "I haven''t had a lot of time to prepare and today was pretty much my first day testing. I had two days on the supercross track then came here and was able to get second. I did a lot of battling but I feel like I still did really well and I rode my best." "It took me awhile to get used to the track," said Swoll, "but once I did everything was great. My qualifiers set me up pretty well for the night show. I got a good start in both motos and came out with a third in the first moto and second in the second moto for second overall. It was a good night and I''m happy."